La Pointe is a ready-to-camp micro-shelter designed for the Poisson Blanc Regional Park located north of Ottawa. 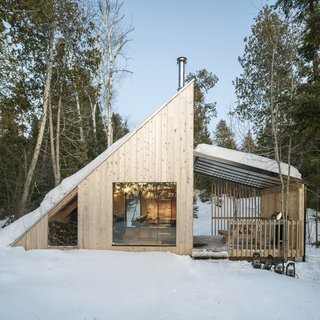 With its triangular geometry, the shelter offers a reinterpretation of the legendary A-frame popularized in North America in the 1950s. It was important for the designers to create a simple, almost sculptural structure that would provide functional and nature-oriented spaces. The small, off-the-grid building, capable of hosting two to four guests, was built on site by L’Abri’s construction team. uploaded La Pointe by L'Abri through Add A Home. The bed is suspended by steel rods over the dinning table and is accessible by a ladder. The table can be converted in a second bed in order to accomodate up to four guests. The bed is suspended in the cathedral ceiling, overlooking the cabin. La Pointe was built by L'Abri's sister company, L'Abri Construction.